It’s thin, it has the Retina Display. HD video. Gyro. Amazing gameplay. It’s the most popular music player, and the #1 portable game player. The revamped models look the same as the fourth-generation iPod touch, which was available only in black. The new iPod touches now come in both black and white. As mentioned, the entry-level 8GB version now starts out at just $199. Apple is clearly positioning this device as a portable gaming machine, aiming with it directly at Sony and Nintendo. 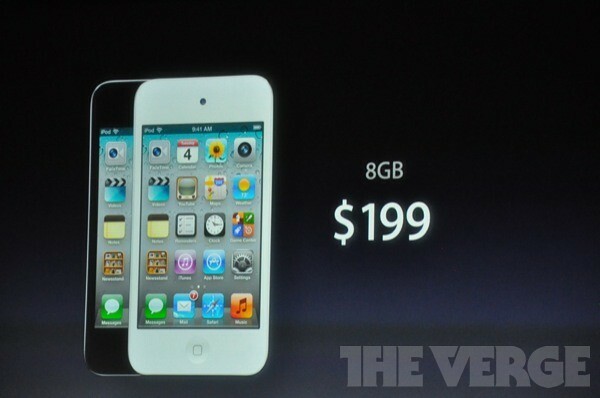 So, the new iPod touch lineup now looks like this: The 8/16/32GB white or black iPod touch for $199/$299/$399. It goes on sale October 12. Sweet.